a story which I mentioned I shall write later ..I am writing the same here. "जैसा भाव रहे जिस मनका, वैसा रूप हुआ मेरे मनका "
Same is reflected in this story.What is wanted on our part is complete surrender to Sainath and pure love At HIS feet .HE is always with us and Always guiding and taking care of us. "I look at everyone with equality .Many people come to My darbar with different motives and needs.The people who are here,are also as different as different can be ,Some are God-fearing ,some are seekers of knowledge and enlightenment,Others are seekers of wealth ,health and progeny.Others are rogues.Nonetheless I look at each and everyone with equality". 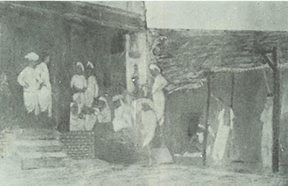 The year was 1913 and "Naam Saptah was being performed by some of the devotees.The Dwarkamayi was packed as devotees had gathered together to participate in the week long programme.Savitri Bai Tendulkar was also present and so was Baba Sahib Tarkhad. Baba calmly said,"Go Shama ,there is a man sitting against the wall of the Sabha Mandap.He wishes to have Darshan.Go and bring him up immediately." Shama did as he was bidden.Indeed ,there was a man huddled next to the wall of Dwarkamai.But he was in bad shape. The man was not very old.But his hands were shaking and his head was nodding .He was drooling at the mouth .His body was full of boils that oozed pus.Some of the boils has turned open sores that were full of maggots.Flies covered his chest .The torn clothes that he had on were filthy and dirty.There was an overpowering stench of foul odour. Shama seemed oblivious of this,and holding the man by his hand ,brought him to Baba.The man fell at Baba's feet and tears of joy poured from his eyes.Baba placed his hand of benediction on his head and said "Bhau,what have you brought for me ? ".This devotees joy knew no bounds at that moment .Slowly and painstakingly,he took out a dirty piece of cloth and opened the bundle .Inside the bundle was a small paper that had 2-3 pieces of sugar candy.With his shaking hands ,he handed the candy to Baba with utter devotion.On receiving the candy ,baba gobbled it up. Than Baba placed His palm on his head and gave him udi and permission to leave.The man slowly but joyously left the Dwarkamai.Baba Sahib Tarkhad watched the whole scenario with keen interest and was so moved by baba's compassion and love ,that he could not hold back his tears. Shirdi Sai Baba Vrat in Tamil Language.